Thanks to the recent Fujifilm rebates, I have been able to expand my lens line-up for the Fuji GFX 50S that I have had the pleasure of shooting with ever since it came out. I am very impressed by the Fuji medium format system, especially its lens line-up, and I consider it to be ahead of its competition in a number of ways, as highlighted in my review. However, having gone through multiple lens samples of different lenses (which I will be reviewing in the next few weeks), I wanted to warn our readers of potential issues they should watch out for. While I am generally happy about lens variation of GF lenses and I am especially happy with their excellent performance, I am not a big fan of Fujifilm’s QA processes. It seems to me that Fuji is almost rushing with the GF lenses, trying to deliver as many units as possible to try to match the demand, while paying less attention to its manufacturing processes. I have already gone through multiple samples of a number of lenses, including the Fuji GF 63mm f/2.8 and Fuji GF 110mm f/2 and I have found debris between lens elements that is impossible to shake off or remove without having to send the lens to a Fuji service center. See the size of that thing? And that’s not the first time I see it either. The previous copy of the 110mm f/2 had a piece of thick hair, or perhaps a thinly sliced piece of plastic, that was stuck between one of the rear lens elements. While small dust specks will never make their way into images, much larger pieces like this are potentially going to cause more flare, visible dots in lens bokeh and other potential issues. And let’s not forget about the damage they do to resale value, since nobody wants a lens with a piece of something large stuck in it. Not as bad as the previous one, but those 3+ specks looked like pieces of metal that fell off from the side of the lens, most likely got knocked off during transportation. I called Fujifilm USA about this issue and expressed my frustration. The customer representative I talked to had a conversation with service manager and they had a couple of options for me. The first option was to send the lens back to B&H for another replacement or refund, and the second option was to send the lens to Fujifilm USA service center (after filling out this repair form), so that they can disassemble the lens, remove the dust and reassemble it. Unfortunately, I would have to pay for shipping to get it serviced with Fujifilm USA – they only cover return shipping. I go through a lot of new lenses and I always inspect them, even if they are loaners, to make sure that I test good copies for reviews. The QA issues I see on GF lenses are a bit concerning to me, as I have seen this issue a number of times now, something I normally rarely come across when testing lenses from Nikon, Canon, Sony and even other third party manufacturers. I really hope Fuji ups its QA game and does more thorough inspections before sending lenses to its distribution channels. Big thanks to B&H Photo Video for willing to exchange every bad copy of Fuji lenses. 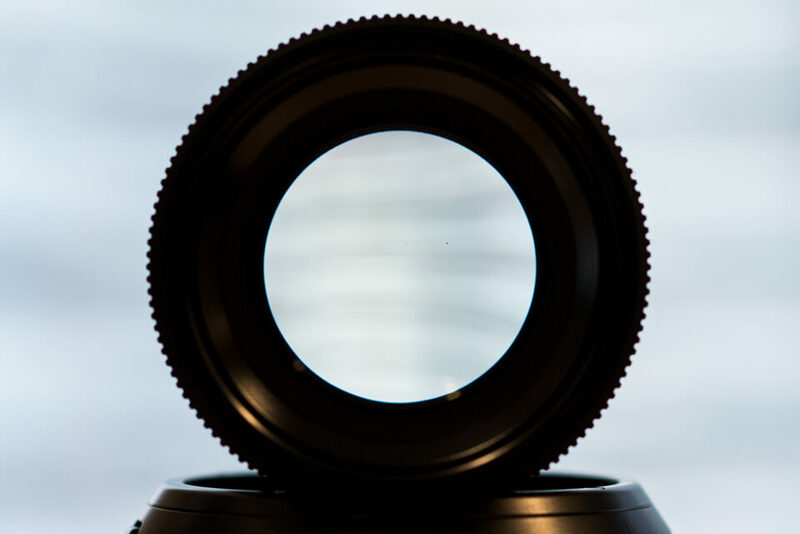 Lens variation is generally good, but you also have to watch out for potential issues with lens decentering and overall performance. Lenses such as the GF 23mm f/4, 110mm f/2, 120mm f/4 have all been stellar (tested at least two samples of each), but cheaper lenses like the GF 45mm f/2.8 and GF 63mm f/2.8 have shown more variation than I would like to see. The lens to watch out is the GF 32-64mm f/4. While it is a pretty solid performer overall, the samples I have tested so far had uneven corner to corner performance, indicating poor assembly / decentering issues. So if you want to own the zoom, make sure that you test it out thoroughly. If you are considering the Fuji GFX system, please be aware of these issues and make sure to thoroughly check every lens you receive to make sure that it does not have any problems. And if you already own the GFX system, please let us know if you have similar concerns in the comments section below. I am trying to find out if I have been simply unlucky, or perhaps more Fuji owners are having the same problems out there. Thanks Nasim for heads up.This problem of Fuji lens quality issue has been happened to one of my colleagues who mainly shoots with Fuji medium format.He went back to Nikon D850 ecosystem for the meantime,after a few attempts of changing lenses. Amir, would love to hear from your friend directly to see the exact issues he/she encountered. If I recall it correctly,in one of the lenses,there was balsam separation issue.In the other one,there was serious focus issue that took almost a long time to be fixed.Seems Fuji needs to have Sigma like dock! Amir, Fuji does not need a dock, since it is a mirrorless system and there is no need to calibrate lenses individually for camera bodies. That problem is only for DSLRs with the phase detection AF system. My 110mm lens is clean. I’ve read on Facebook’s Fuji GFX forums of similar issues like yours. My concern is the moving elements of this lens (probably floating ones), I’m not so sure if it won’t break over time. Of course, when the camera is on, they aren’t moving but then… why the strange sound when the camera wakes up from stand by? One more question about the Fujifilm GF 120mm f/4 Macro lens: did you notice any focus shift with it? Since I shoot macros a lot, I’m thinking I’ll better be served by the 120mm macro lens. There is a little bit of focus shift, as expected from any lens, but it is not bad by any means. The GF 120mm f/4 is a stellar macro lens. IIRC, the newest firmware should be focus shift free, as it will do focus on the set aperture. Obviously, if one focuses it manually and then changes the aperture, the focus shift will be still visible. Had exactly the same trouble wit my Fujifilm XF 56mm 1.2 R lens. So the problems are not only in the GFX system :-/ Had to send it back to dealer. Tim, I didn’t see many issues with X-series lenses in the past, but it seems like the quality issues are slipping lately…hopefully Fuji will address these sooner than later. I sent mine twice! The one I have is finally acceptable! Is it marked from what country the lens were made? Franco, all GF lenses are made in Japan – as marked on the box. I’m afraid it’s not only Fuji. Last year, I bought a couple of Sigma ART primes (50mm & 24mm), to take with me on a trip to France. One (the 50mm) was astounding – as promised, both by Sigma and by the photographic press in all the reviews. The other (24mm) was a disaster – AF simply DIDN’T work, and I couldn’t figure why, on the road. When I got home, I checked it out as best I could, then went to one of my camera shops to see if they had any ideas – they didn’t seem to know what it was (which when I looked back later, surprised me), but said enough to put me on the trail. I went to another one on the way home and got a much more knowledgeable guy look at it – he at once diagnosed the problem – severe back focus error. On my D810, the maximum adjustment is plus or minus 20, and it required minus 19, which is just about hitting the skids. I lost all confidence in it and traded it in on a new Otus w/angle. Sorry Sigma – I now have TWO Otus lenses, I dropped $500 getting rid of your w/angle and now I rarely use the 50mm ART, because the Otuses are so much better than yours! Something I never would have found out, if you’d assembled the 24mm ART properly in the first place. I don’t want other people to take a cue from that – I hope my experience was a rare one – but once your confidence is shattered, you normally don’t go back to the same supplier. And if these companies want to stay in business, they should think very carefully indeed about taking a course of action which results in poor quality control. Take a different example – if you bought a particular make of automobile and a wheel fell off while you were travelling at 100 Kph – would you EVER consider buying another car of the same make, ever again? As i know Sigma does not licence autofocus from manufacturers, they reverse engineer the system. That’s why most of Sigma lenses have front focus or back focus issues. That’s why they have that dock that you can connect to a computer and manage your focus by yourself. One can’t license AF from Nikon. It’s not possible since 1. Nikon will not allow it. 2. They go out of the way to make it as hard as possible for any other company to manufacture a AF lens by changing software/firmware. Lovely way to say to their customers *uck off and by our much more expensive lenses. Not sure i buy the whole companies go out of their way to hinder other companies. If Nikon release a firmware update they probably don’t know or care if that update will affect sigma or other third party lenses. How would they know? I doubt its vindictive. Unless they tested the firmware update on a tonne of signs lenses or had all the engineering and firmware spec for them how could they test if that firmware update breaks af? Is it their job too? Red, to your second point, it looks like it is not that hard to focus a Nikon like lens: nikonhacker.com/wiki/F-Mount There will be more information around, this was just a quick search. The protocol of the interface is extended in newer firmwares but compatibility with older AF-D lenses is obvioulsy kept. And btw, a Nikon F5 (1996!) is compatible to AFS, VR anf G lenses. I got a lot of Nikon lenses, from MF to some of the newest over 30 years. I have never ever seen such particles in any of my lenses, but a bit of dust mainly in the zooms. And I had never to return a lens because of quality or out of focus issues. It is a bit a different story with the cameras for me though. There could be a better AF calibrating out of factory. I own the 50, 35 and 24mm Sigma Art Lenses. It’s very difficult to use in body focus calibration on them. I was getting large front focus variations on all three lenses and across 4 camera bodies, it was simply too problematic to fine tune them using the in body method. I recommend that you buy the Sigma USB dock and install the software. Using a combination of the USB dock and a Spyder Lens Cal or other calibration tool it’s possible to get them to focus with a high degree of accuracy. I bought one of these lenses new – the other two were from people who had no idea about calibration. Those lenses were mediocre prior to fine tuning, which is probably why the owners were selling. I picked them up at less than half of the retail price. Once they are fine tuned properly they are stellar. 1) The dust on the lens is not necessarily there when the lens leaves the factory. It can be glue residual or similar manufacturing stuff that is not visible during the inspection but then gets free over delivery process due to excessive shaking and box flipping, landing on the lens. And if someone has tried to move dust from filter, they tend to stick there unless physical force is applied to them (air or cloth). Thus, it might well be that Fuji QA is well up to its task, but the problem realizes after the QA has been made. This was the case with Nikon’s 70-200/2.8 back in the days. 2) Concerning the 1), it might well be that Fuji cannot know about this problem, unless people start to send their dust filled new lenses to service! I see way more of these posts from people from United States, where (if I have understood correctly) it is customary to order a lens and return it to the seller, if there is dust inside. Then, it is up to the seller, if he/she will return it to Fuji. Most likely the seller will not do this, but will instead ship the very same lens to the next customer (either in hope that 2nd customer won’t care, won’t notice, or will deal it through service). This way the same lens with its dust problem can circulate tens of people before it finally ends up to the service, or to someone who does not care or does not notice it. One can easily see the pattern here how this could escalate the issue to seem way bigger than it actually is – one dust lens represents 10s of dust filled lenses, just because people go like “eww, there’s dust, I’ll return it”. 3) Concerning the 1) and 2), and if there truly is a manufacturing process problem that Fuji could fix, but it only becomes visible after the lenses have been shipped from the factory, only way for Fuji to know about it, is that people send their dust filled lenses to warranty service (or a mayhem on internet over dust issues). Warranty cases are tracked and used to improve production to minimize the cost of warranty repairs. Dust inside a new lens is such warranty case. That is, if everybody just returns their lenses, Fuji might not even know about the potential issue at all (as said in 2). Umeet, if you deal with respected sellers like B&H, they will not be sending the same lens with issues to another customer – the lens that gets sent back is returned back to the manufacturer, where the lens is looked at. Few people want to deal with the manufacturer directly, because it is easier to have the seller deal with it when there is a problem, since that’s where they left their money. The dust issue is turning out to be a bigger issue than I originally thought. Out of the three 110mm f/2 units I received, all three had dust / debris. I am giving Fuji one more chance before asking for my money back, since it is becoming ridiculous. Whether it happens at the factory or when shipping does not matter, because if there is crap sitting on the side of the lens, Fuji technicians should be cleaning it up so that it does not end up on lens elements. I am on the phone with Fuji USA right now and I have been on hold, waiting for an answer from someone in charge. I very much hope to bring Fuji’s attention to this matter and hope they can get in touch with the people at the factory, so that they can take care of these problems. I have been very pleased with Fuji overall, but these kinds of issues make it tough to recommend their products to my readers. I would caution people not to be too hypersensitive to problems with their new lens. 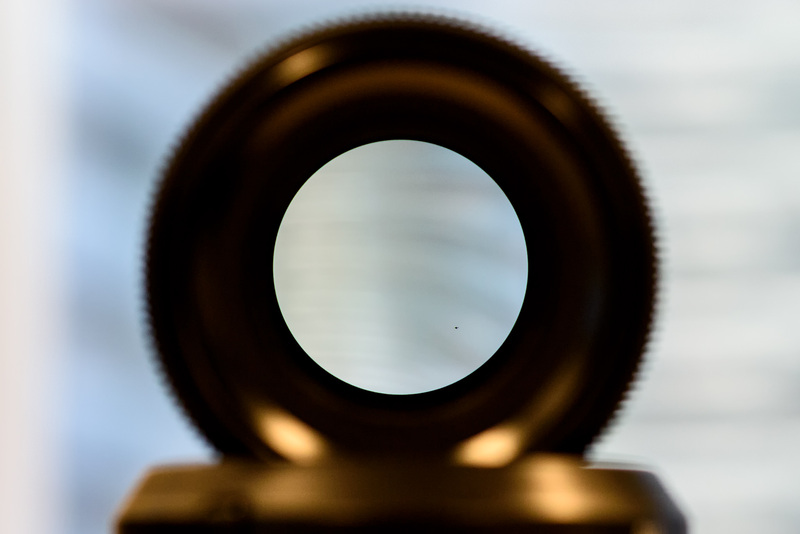 I got my 110mm brand new out of the box and saw the same foreign particle as pictured above when looking through the lens at a white background on my monitor. I took a rocket blower and blew out the lens from the rear end and it disappeared. Apparently there was some lint that was blown out which I would not have expected with a brand new lens out of the box…. I had a problem with my 9-month-old XF-18-55mm Fuji lens. After searching the web I found many others with the same issue. It’s basically a bad lens mount and must be returned to Fuji for service. When it happens the camera (X-T2) error message is “turn the camera off and turn it back on”. I did this many times but the camera simply refused to fire with the lens. It worked perfectly with my other lenses. Seems to me that having this problem after so little use is totally unacceptable but Fuji’s service people were less than cooperative and my only recourse was to send it in for a repair that takes 3 weeks. That’s a week to get it there, 3 weeks to repair and another week to get it back if all goes well. And the shipping cost me $22. I am a relative new Fuji user and am very unimpressed with the quality issue and the customer service. I realize this is not one of Fuji’s best lenses but it got rave reviews on all of the sites I visited. Sadly that has not been my experience. I am in process of urchasing a GFX50R together with the 23mm F4 and the 32-64 F4. I ihave read you comments which were in respect of problems in Jan 2018. I would appreciate it if you cold let me now whegther you have done any more receny testing and your results, ;please.